Inclusion of other data in the report such as scenario assessments, etc. We use a mix of top-down and bottom-up approach to estimate and project the growth of the market over a define forecast period. We utilize these methods to understand the historical movement of the market which helps us in analyzing the future growth trends. With the top-down approach, we breakdown the global industry into different components where the overview of the market is formulated. Each segment is further analyzed and broken down into sub-segments. These components are then analyzed to understand the impact of their movement on the global market. In the bottom-up approach, individual components that are part of the global market are pieced together and summed up to arrive at a total. 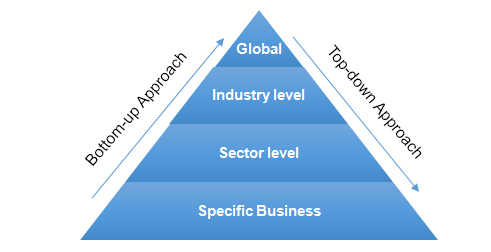 The bottom-up approach is used to formulate the sizing of the global market. Our data is triangulated by referring to various secondary sources and cross-validating it against our findings through primary research. The primary interviews and surveys derive directions from extensive secondary research. Secondary research is a continuous process and is conducted at each level along the value chain.